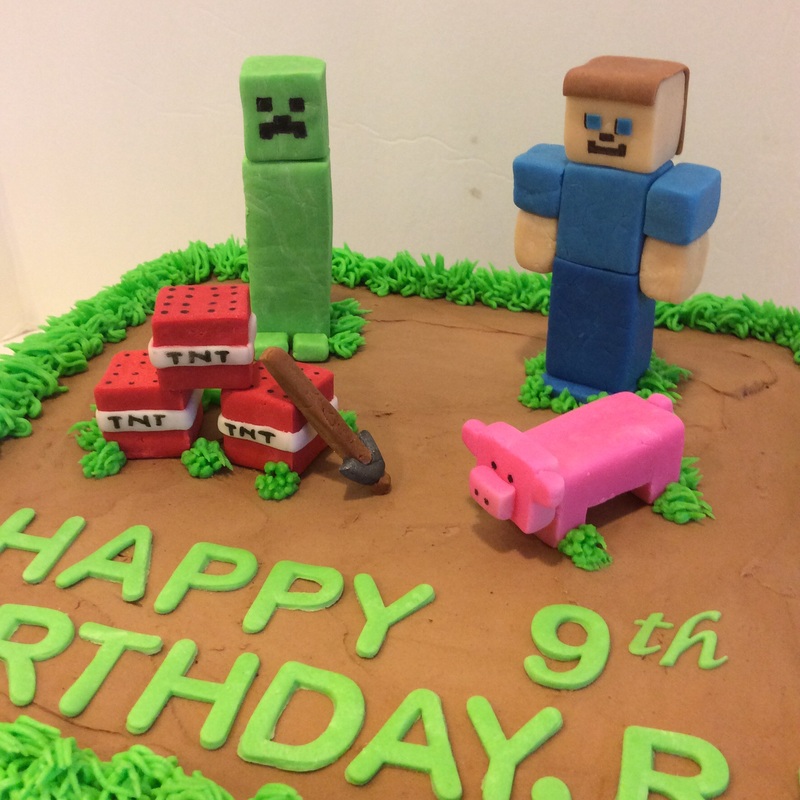 I’ve gotten better at making the fondant figures and the cake has gotten a bit bigger, but the basics are the same. This is a 10″ 2-layer cake (chocolate/vanilla) with cookies and cream filling and chocolate buttercream icing. 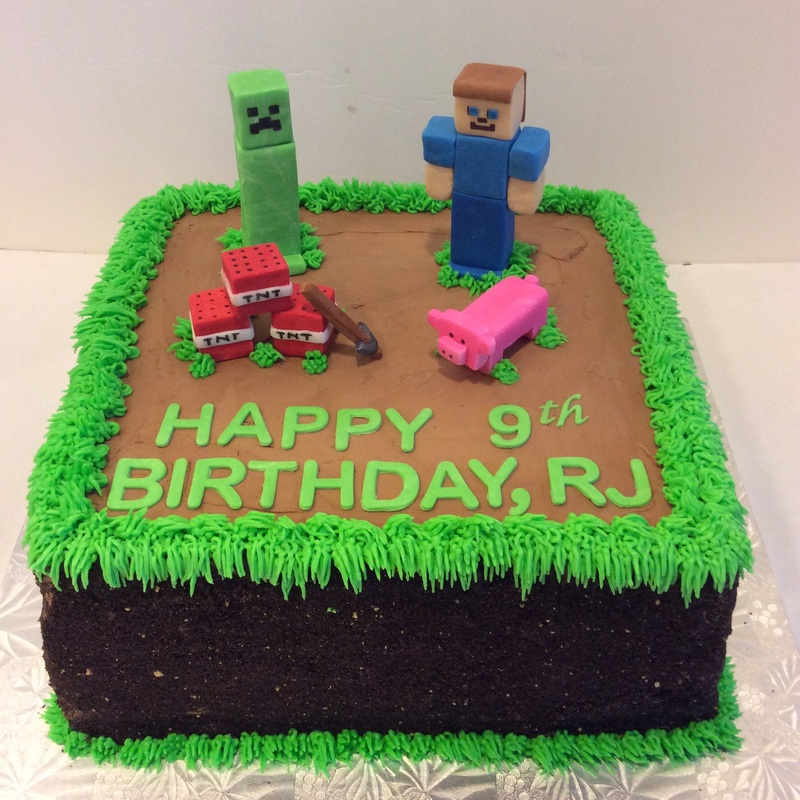 The “dirt” on the sides is made from crushed Oreo cookies pressed onto fresh buttercream and the grass is piped vanilla buttercream tinted green. The figures are handmade from homemade marshmallow fondant. Believe it or not, I’ve had requests for this cake from as far away as New Zealand! Although I don’t ship the cake, I have sent the fondant figures all over the globe! Apparently the Mincraft craze is alive and well! Hope you had a terrific birthday, RJ!! 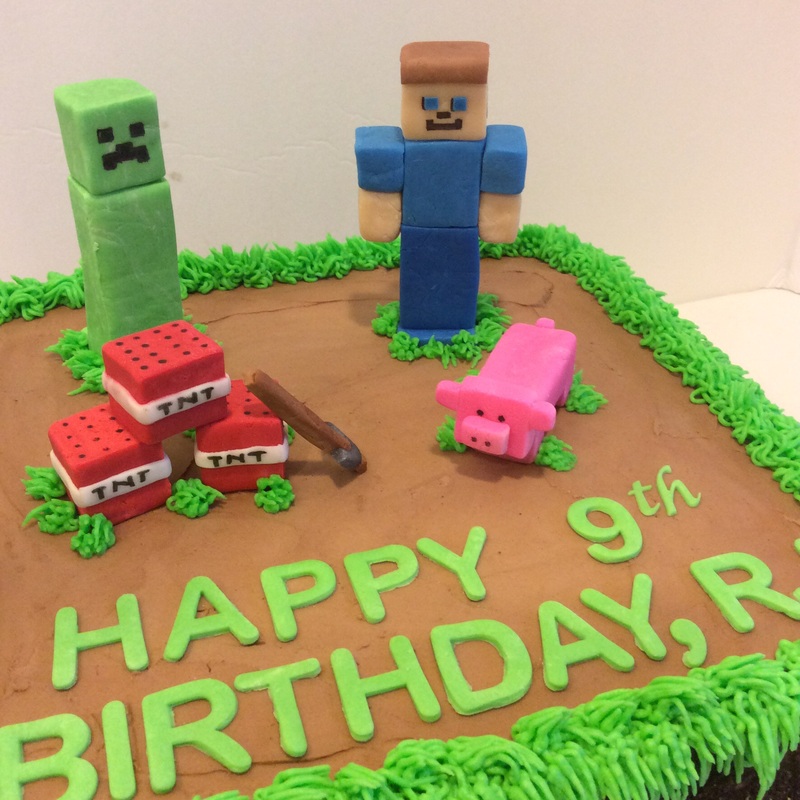 I really enjoyed making your Minecraft cake! Sorry that I don’t have my recipes on my blog…something I mean to do in the near future! But for this cake, any good chocolate cake recipe will do with a good buttercream. I use a square 8″ or 10″ pan, 2 layers. Ice the stacked layers with chocolate buttercream and, while it’s still soft, carefully pat crushed Oreo cookies onto the sides to look like dirt. Then use a grass tip to pipe green grass around the top. Thanks for the cake recipe! I would love to order the fondant figurines from you. Do you ship to NYC? I sure do ship to NYC! Do you have a date in mind? I’ll need to fit them into my schedule and takes a few weeks to make them, dry, etc. Let me know a date and I’ll see if I can do them for you.